This antipasto loaf is the perfect vegetarian make ahead sandwich for the summer with cream cheese, spinach, pesto, artichokes and sun dried tomatoes. Ever since I got back from my trip to Banff last month, I’ve been in the city taking care of my little pup, Sophie. Since I haven’t been able to head up north yet or take a holiday away from Toronto, I’ve found that for me, picnics are the perfect summer-in-the-city getaway. My friends and I used to have picnics pretty often in a park which will forever be known as “Flower Park” because of the gorgeous flowers all over the park (technically, it’s called Alexander Muir Memorial Gardens and it’s one of my favourite parks in Toronto). We would keep things pretty low key and pack a baguette, some cheese and a salad (often this quinoa salad) but now now I’ve discovered the perfect packable, picnic lunch: this antipasto loaf from Kraft Canada. 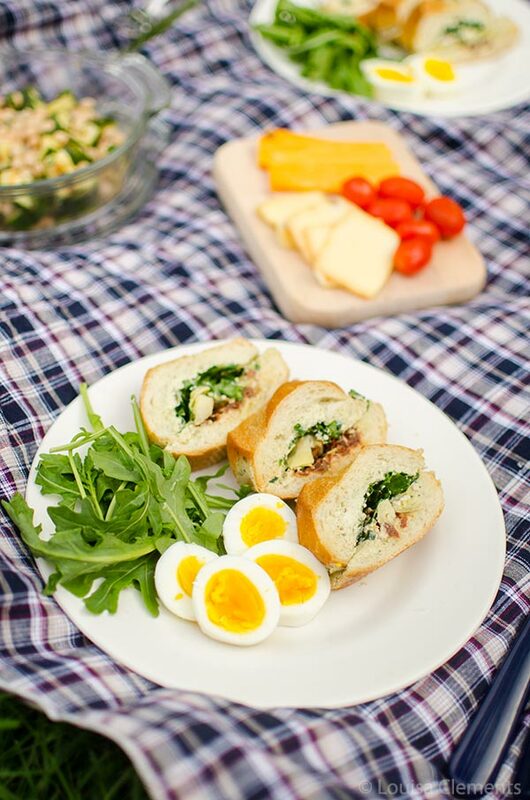 The most important thing for a picnic is preparation and I love that this antipasto sandwich can be packed ahead of time (up to a day before!). Which means, all you have to do is prep this stuffed sandwich the day before and then after work, you can just grab and go and head to your favourite picnic spot. That’s exactly what I did last Monday, we headed to my favourite park for a little post-work picnic. The picnic was fantastic and turned around a serious case of the Mondays (my day started off with a bang when Sophie went MIA, thankfully she was found and everything was ok). I rounded out my picnic with perfectly hardboiled eggs, an arugula salad with a favourite homemade salad dressing and a new summer zucchini salad recipe. Are you a fan of picnics? What kinds of foods would you pack with you? Packed with Italian flavours, this vegetarian stuffed sandwich is a simple picnic or potluck staple. Prepare it a day ahead for optimal flavour. This antipasto loaf is packed with cream cheese, spinach, pesto, sun-dried tomatoes and artichokes. 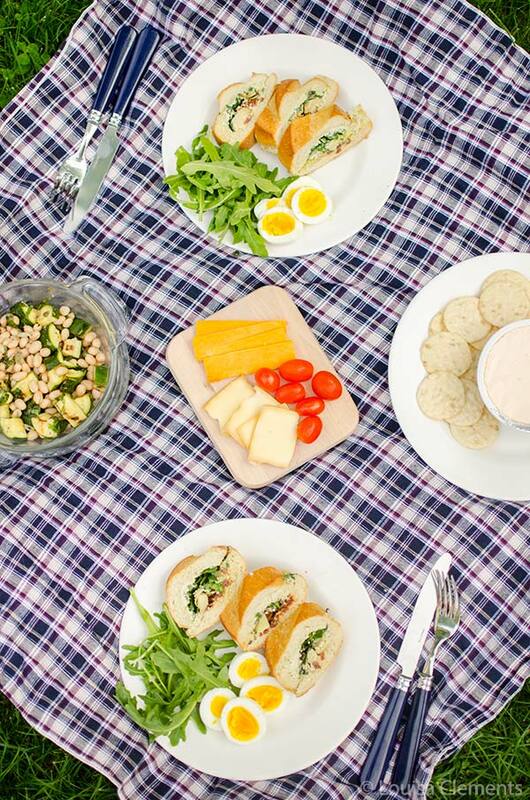 Are you feeling ready to pack a picnic? Get started with this recipe for an antipasto loaf! Cut baguette horizontally in half; remove bread from centre of each half, leaving 1-inch-thick shells. Reserve removed bread for another use. Mix cream cheese product and pesto until well blended; spread onto insides of bread shells. Fill bottom bread shell with remaining ingredients; cover with top of bread. Wrap tightly in plastic wrap. Refrigerate up to 24 hours. Disclosure: This post was sponsored by Kraft Canada – as always, all opinions are my own. Thank you for supporting my sponsors and allowing me to continue creating content like this antipasto loaf! Picnics are such a fun way to share summer food outdoors - I LOVE picnics so thanks for this recipe! Do you have any suggestions for a healthy kid friendly treat hat I can add for my kids? Thanks, Fiori - they really are perfect for summer! I would recommend my 5 ingredient honey almond granola, healthy and loaded with protein. Thank you - it looks delicious! I had to come on and see how this beautiful Antipasto Loaf is made. I love picnics even simply eating in the garden with my family. Absolutely gorgeous photography and I've pinned the recipe. Thanks for sharing your picnic passion. Thank you Sammie! I hope you liked this recipe.